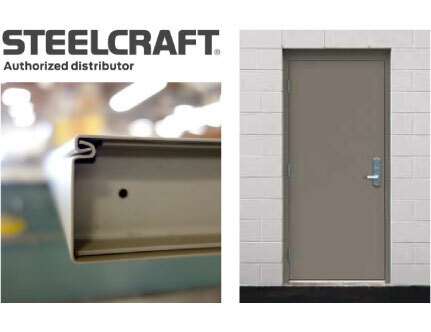 Designed for commercial, institutional and industrial applications, Steelcraft provides a full selection of hollow metal doors and frames for virtually any wall condition or entryway requirement. Known for their high quality construction and durability, Steelcraft products are SDI Certified and Made in the USA. Trudoor is an authorized WHI fire-labeled shop, enabling us to modify, re-certify and label Steelcraft fire-rated doors and frames. 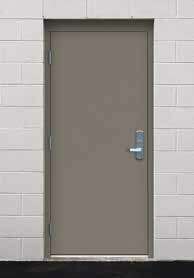 The Steelcraft Falcon SZ Series door is an affordable non-handed, square-edge door solution designed to meet your requirements for commercial quality full flush steel doors. 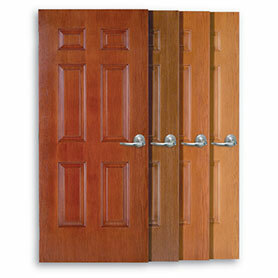 Continuous bonding of laminate core to steel face sheets provides an attractive, flat surface, making the L Series doors ideal for interior and exterior applications. Steelcraft L20, L18, and L16 all meet architectural requirements for full flush doors, while the L14 flush doors provide the best choice for maximum-duty full flush doors. 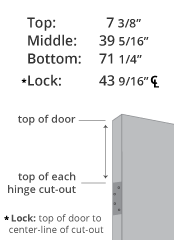 L Series doors are 1-3/4” (45mm) thick and offer a wide range of specifiable options covering sizes, core material, glass light designs, optional edge constructions and mechanical and electrical hardware preparations. Tested both internal and through certified third parties these doors provide the necessary performance to meet the broadest of opening needs. 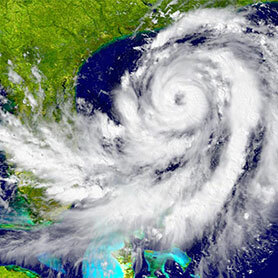 The H16 and H14 Series exterior flush doors provide attractive and versatile options while meeting Florida Building Code specifications for cyclic and static wind pressures and windborne debris impact loads. Continuously bonded cores and full-height mechanically interlocked edge seams provide durability, with additional options covering edge construction, core variations and finishes. A versatile selection of design options also include glass lights, transom and sidelights, louvers, exit hardware and cylindrical or mortise single point locks. 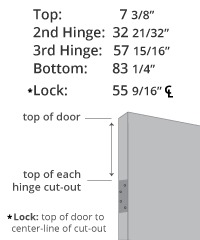 The H16 Series flush doors feature 16-gauge galvannealed steel for extra heavy-duty usage and the H14 Series flush doors feature 14-gauge galvannealed steel for maximum duty usage. The F Series frames meet requirements for light-to maximum-duty applications in commercial and industrial buildings. F Series 3-sided flush frames are designed to meet requirements for standard to maximum duty applications including commercial, industrial and institutional buildings. They are installed in both interior and exterior locations, and in virtually all types of buildings and wall constructions. 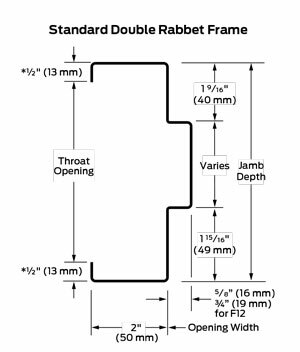 They are designed for installation as part of the wall framing sequence and may be specified and supplied as knock-down (KD) for field assembly prior to installation or welded for installation as a complete unit. 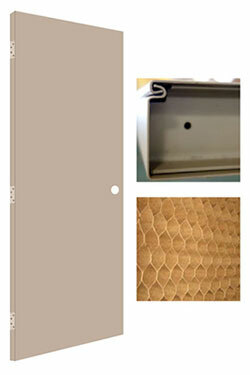 The K Series’ unique design assures quick, neat installation on finished drywall construction. K Series Drywall frames are designed for light to heavy duty applications in both commercial and institutional buildings. 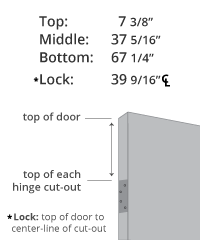 They can be installed in rough openings after the wall has been constructed and finished. 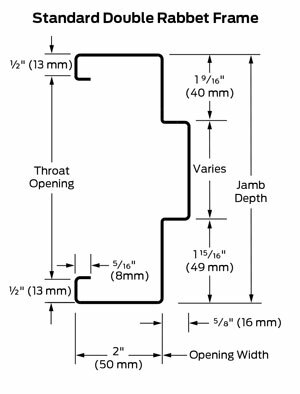 To accommodate the installation of the K Series Drywall frames on finished drywall construction, they are supplied with a KD (knock-down) corner for quick installation.